Writer Shawn Warner offers a follow-up to his first post, Discovering Those Better Stories. The big news of '86 for me was not graduating high school (which was more like an escape from a white trash hell) but the publication of a little book that would forever change my life. It would also cement my future as not just a devoted comic book reader and collector, but specifically a Batman fan. Batman: The Dark Knight Returns #1 hit the racks and nothing would ever be the same in my little world again. The Dark Knight Returns is thought of as the best Batman story ever. Written and drawn by Frank Miller (who in '86 had become my favorite creator, even though I was on a real Alan Moore kick with Watchman coming out the same year) Dark Knight was superbly inked by longtime collaborator Klaus Janson and beautifully painted by Lynn Varley. This is the work that single-handedly brought Batman back to his darker vigilante roots, back to the night and away from his recently lightened tones. Only in the mid '70s did Batman regain some of his original gritty noir due in large part to the work of Neal Adams. But he still lacked that edge that dubbed him The Dark Knight. 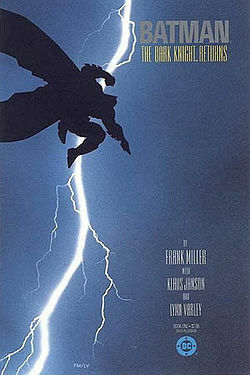 Frank Miller’s Dark Knight looked different; for one, it was the first Batman comic to be released in the prestige format. For another, Bruce was old and gray. And Robin was now a young girl named Carrie. All of these changes were superficial compared to the core changes that a more violent Gotham had wrought inside Batman. He kills the Joker in what would be their final confrontation, as well as engaging in a momentous battle with his close friend and ally Superman. The Dark Knight changed the face of the modern comic book and it changed my sensibilities in a world where nuclear war was a regular topic of dinner conversation. And where the birth of cable television opened my eyes to the plight of a world I'd only heard about from bands like U2, The Clash and R.E.M. It was Batman, not Ronald Reagan, who saved the world for me. I grew to be an adult and watched my much-loved Batman (and comic books in general) go through some serious changes. I witnessed the birth of Vertigo and watched a young Scottish man become the greatest writer the genre has ever known --of course I’m referring to the magnificent Grant Morrison. I survived Image comics, and chromium and die-cut covers; I watched creators jump ship for money and saw the rise of creator owned properties. Despite all this, I still held onto that spark of innocence that brought me to comics initially. In my personal life a tsunami called heroin addiction took my cousin Alex from me. He overdosed and died alone in a dirty hotel room at the age of twenty-five. I was lucky enough to survive my own battle with the demon, losing everything but my life. I’ve had to regain my comic books many times, as I lost or sold everything I owned over the years to finance my addiction. But I have been clean many years now and am firmly set upon a course of recovery. I attempted suicide six times and spent months and months in psych wards only to rise like a phoenix from the ashes and continue with my writing and my love for comics. I have a beautiful wife and an amazing son that God has seen fit to bless me with. Even though I have lost my Grandmother and my cousin, I have never regretted my decision to keep the woman who carried me in her womb for nine months (Mother just doesn’t seem to fit this awful woman) and her terrible twosome of anti-siblings far away from my life. I have had limited contact with them over the years and know them to be horrible excuses for human beings. I have been to some of the worst places inside and outside the mind. I have had and lost almost everything a man could ask for, but through it all comic books brought me peace. And kept me from going completely over the edge. I owe my life to men I may never meet: Frank Miller, Grant Morrison, Alan Moore, Sal Buscema, Neal Adams, Michael Golden, and Stan Lee. The characters they have created and the stories they have told are what made this world worth sticking around for when I couldn’t find a single reason to go on. So this piece is dedicated to them. And to the worlds that have opened to me and millions of others who suffer with the pain of depression. Comic books have been a safe haven of escape when no one else wanted us. Thank you and Excelsior!